What is it that most minivan shoppers are looking for? Something spacious? Something safe? Something technologically sound? All of the above, right? A minivan is the epitome of a family vehicle, and to be a high-quality one, it should be comfortable, impeccably safe, and modern. The Kia Sedona checks those boxes and then some. Key features include seating for up to eight, blind spot monitoring, Slide-N-Stow seats, and forward collision warning. If you’re driving around with your family, their safety should be your top priority, and the Sedona has no shortage of safety features. Keep reading to learn more. Any time you get behind the wheel, the safety of yourself and everyone on board should be your main concern. The 2019 Sedona has modern active and passive safety features that are designed to prevent accidents altogether as well as limit the damage of one that is unavoidable. Available active safety features include lane departure warning, driver attention warning, smart cruise control, rear cross-traffic alert, and a rear camera display. Passive safety features include an advanced airbag system, vehicle stability system, traction control, anti-lock brakes, brake assist, and front and rear crumple zones. While safety is a big part of the 2019 Kia Sedona, there are plenty of other enjoyable features as well. Apple CarPlay, Android Auto, Bluetooth connectivity, wireless phone charging, keyless entry, tri-zone automatic climate control, and leather-trimmed seating all come available to make your drive as comfortable and convenient as possible. 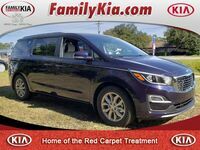 Those interested in learning more about the 2019 Sedona should come down to Family Kia and check it out for themselves. Our friendly salespeople will go over everything else you need to know like pricing details and financing options. Come on by and we’ll get you set up with a test drive. We hope to see you soon!